I’m not sure if Lemony meant this parallel or not, but I find the characters of Count Olaf and the young Baudelaire children illustrate a tug of war that goes on inside of everyone of us. And please understand this is just observation and reflection (an exercise I’ve learned from my friend Richard—both how to do it and how tremendously valuable it is). It is not an effort to preach at you or to wax eloquent in the area of psychology or film criticism. I should also add that this is a pretty spoiler free write-up if you haven’t seen A Series of Unfortunate Events yet. Let’s start with the children. They are smart, creative, innovative, hard working, and each has their own special talents. They suffer, but when that happens they do the right things: ask for help, come up with a plan, work hard, and persevere. I think that is what most of us can say we aspire to. We want to be both known and remembered for these characteristics. We do and say things to prove to ourselves and others that they are a part of who we are. And it’s true! But then there’s Olaf. Olaf is looking out for himself. He wants things he can’t have and tricks people into getting what he wants. He doesn’t simply do good things in a way to remind himself that he can be, and is, a good person. He does and says things in a way that is blatantly selfish. He is either explicitly doing/saying something that is wrong so as to get what he wants, or he deceives people into thinking positive things about him and his plans, even to the extent of disguising himself as a different person. He wants wonderful things in life, just as the Baudelaire’s do. Just as we all do. But his underhandedness is despicable and enraging. Now, this is not to say that this is what we are all like, but inside our hearts there is this id, this Count Olaf. There is a desire to get want you want a little quicker. To take shortcuts and forget about other people. Sometimes we do things that are mean, deceptive, hurtful, selfish, even “crazy.” Any characteristic you see in someone that you find to be annoying (at best) or evil (at worst)—you are capable of them all. Every one of us is. I find it helpful for me to see people in this light. I may be angry, bothered, hurt, or even completely disgusted by someone, but that’s Count Olaf getting through. He’s winning at the moment. That person is not my enemy. I know the Baudelaire children are in there. And they need help. Ok, yes this does sound preachy. But please understand this is what I have in my mind and heart. It’s as real to me as oscillating fan that is cooling me off right now as I type. I’m not sure I want to lash out at Olaf; however, I do know I want to find those children and help them escape his grasp. After all, it is what goes on inside me, too. 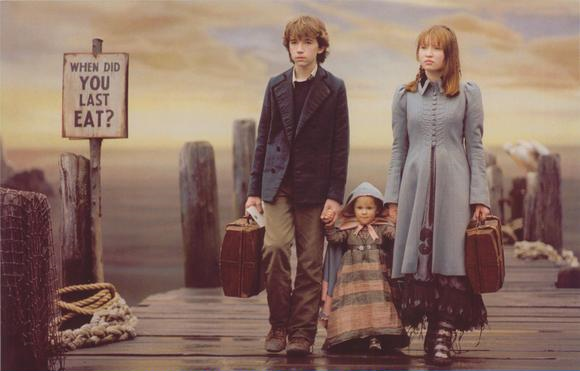 Congratulations, A Series of Unfortunate Events. This is your week. Best Actress: Catherine O’Hara. She makes me laugh out loud in almost every movie, TV show, skit, cameo, etc. that I’ve ever seen her in. 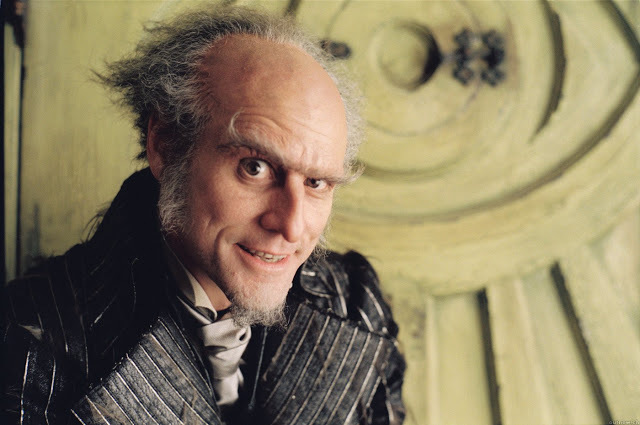 Best Actor: Jim Carrey as Count Olaf. No one can make a character as quotable as Jim Carrey does. I love him as Olaf, as the Grinch, as Lloyd Christmas, and as any character he has taken on. Best Quote: “If you’re ever buying a shampoo sink go right to the Dutch. The French know nothing about shampooing.” — Michael McKean as Stefan Vanderhoof in Best in Show.